The present case has been reported in the Indian Journal of Ophthalmology. A 42-year-old female, farmer presented with chief complaint of swelling, medial to the medial canthus of the right eye associated with mild pain, and redness for the past 8 months. The patient complained of minimal watering from the right eye which was occasional with no history of discharge. On clinical examination, her best-corrected visual acuity in both eyes was 6/6 and N6. Slit-lamp biomicroscopy showed normal anterior segment with normal intraocular pressure. Syringing revealed a patent lacrimal system. 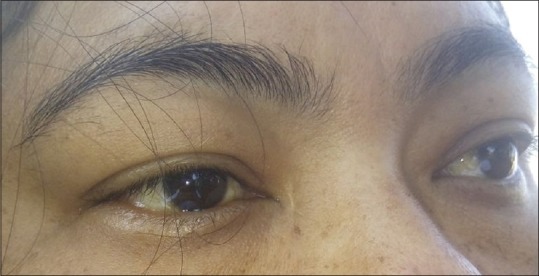 There was a 4 cm × 2 cm swelling over the right lacrimal sac area. On palpation, it was nontender and cystic in consistency with restricted mobility both sideways and vertically. The overlying skin had normal texture and was freely mobile. Thus, a differential diagnosis of dermoid, mucocele, or soft-tissue tumor was made. A CT scan of orbit was advised to define the limits of swelling and to image the bony architecture and paranasal sinuses. 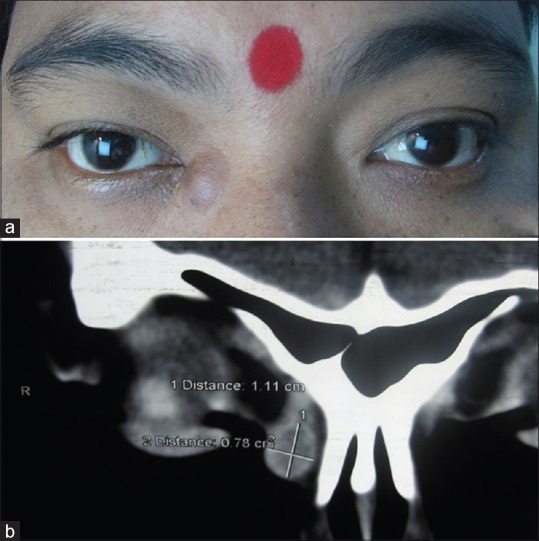 It showed a mass lesion of dimension 1.11 cm × 0.78 cm over the lacrimal sac area which was isodense with the surrounding soft tissue with smooth margins. Under LA, soft-tissue dissection was done and it was found that the cystic lesion was not adherent to the lacrimal sac. Excision biopsy of the cystic lesion was done and sent for histopathological examination. On exploration of the cyst, a creamy white thread-like live worm was found. The worm had active motility when transferred to a container containing normal saline and was video documented. Histopathological examination of the cyst revealed granulomatous inflammation. Based on the morphological features, the worm was identified as adult female T. callipaeda.